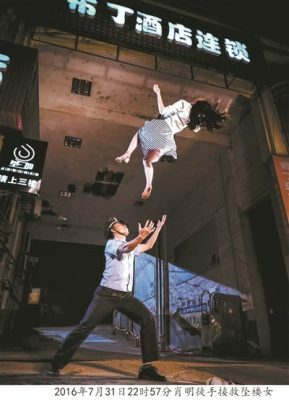 This week we had a range of Chinese media stories, including two debates happening online and in the news pages — one about a finance expert’s suggestion that China’s private sector should “yield” to the public sector in light of economic pressures and the need to concentrate national strength, and another about the authenticity of a police propaganda photo (above). Also this week, a notice on changes at the National Radio and Television Administration (NRTA) suggests the body will no longer be responsible for the management of journalists’ press credentials in China, news publishing, the printing business and other areas, but will focus instead on online video and strategies for convergence across networks (telecoms, radio and television and the internet). Also on our list is the apology from Netease for unspecified content violations, which we covered several days back. On September 12, finance expert Wu Xiaoping (吴小平) published an article online called “China’s Private Sector Has Already Achieved the Task of Assisting Public Sector Development, and It Should Now Leave the Field” (中国私营经济已完成协助公有经济发展的任务，应逐渐离场), arguing that the role of the private sector has been to “assist the public sector in achieving leapfrog development,” and that this goal has already been achieved. For this reason, wrote Wu, “in the next phase, it will not be so easy for the private sector to expand blindly.” Wu further noted that the United States and other developed economies have are coordinating to contain China’s rise, and the country would face unimaginable pressures and obstacles if it could not find ways to consolidate its national strength. Wu Xiaoping’s arguments were attacked in many Party media. On the 13th, the Economic Daily, the China Business Times and The Beijing News all issued responses emphasizing the so-called “two unmovables” (两个毫不动摇) – the idea, emerging in the political report to the 19th National Congress of the CCP in October 2017, that both public and private sector development must be encouraged and supported. The WeChat public account “People’s Daily Commentary” (人民日报评论) said that in a period of difficult transition for the Chinese economy the role of the private sector was more crucial than ever. Some commentaries appearing on WeChat argued that there was merit to Wu Xiaoping’s arguments and that the strong reaction reflected collective concern over the direction the economy was heading. WeChat Public Account “Phoenix Online Finance” (凤凰网财经): 私营经济应离场？谬论刺激的焦虑才是真问题! Special funds from China’s Central Treasury have been approved for political and ideological work at China’s universities (高校思想政治工作专项资金), entering the overall budget for the Ministry of Education. In recent days, the Ministry of Education has released a document called Provisional Regulations for the Management of Special Funds for Political and Ideological Work at Universities (高校思想政治工作专项资金管理暂行办法), providing the specific applications, management and principles of the special fund at Chinese universities. The provisional regulations stipulate that uses of the special fund include: carrying out study and propaganda campaigns at Chinese universities on Xi Jinping Thought on Socialism With Chinese Characteristics for the New Era; cultivating of “advanced models” (先进模范) and “superb exemplars” ( 优秀典型) for use in political and ideological education that have national relevance; developing lessons and methods for promoting praise for “excellent Chinese traditional culture” on campuses, and for creating a healthy campus culture; conducting research on political and ideological work at universities, and other programs. 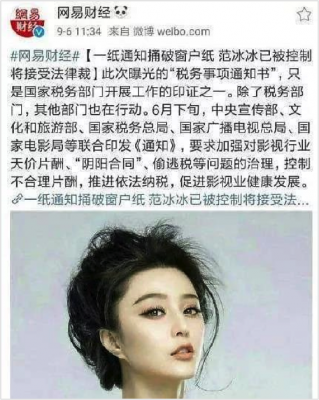 On September 11, Netease issued a “Rectification Notice” (整改公告) that said: “Owing to a number of serious problems that have occurred in the process of operating the Netease Finance Channel, it is decided that from September 11, , effective 12PM, [the channel] will cease content refreshing and carry out a deep and thorough rectification, energetically purging illegal conduct. On September 9, many social media accounts in China heaped doubt on the authenticity of a photograph appearing at Hunan’s “Eternal Flash Photography Exhibition” (永恒瞬间摄影展), held to commemorate 40 years of reform in the province. 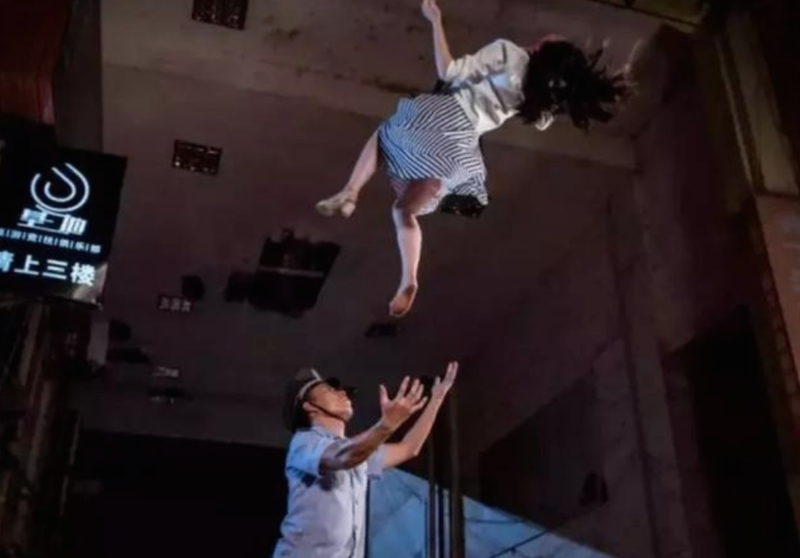 Titled “Policeman Catching Falling Woman With His Bare Hands” (民警徒手接坠楼女子), the photograph shows a young woman in a white top and striped skirt caught in mid plunge from a building. Beneath her, a police offer steps up confidently to receive her in his arms. Sharing the picture across numerous sites, internet users questioned whether a real-time photograph of such quality would ever be possible. On September 10, the propaganda office of the Hunan Provincial Public Security Bureau made a public explanation for the photo, saying that in fact it had been taken by a production team to reenact a scene from July 2016. It had been created especially for the exhibition. On September 11, the Central Institutional Organization Commission, an agency of the Central Committee of the Chinese Communist Party, published new guidelines on its website for the National Radio and Television Administration (NRTA). A comparison with similar guidelines released in 2013 for what was then the State Administration of Press Publication Radio Film and Television (SAPPRFT) shows a number of changes to personnel and departments within the NRTA. The language of the notice removes reference to “responsibility for the supervision and management of the issuance of press cards for journalists nationwide” (负责全国新闻记者证的监制管理), and also removes content about the office taking responsibility for news publishing (新闻出版), copyright management (著作权管理), digital publishing (数字出版), printing business (印刷业务), and the coordination of national campaigns against indecent content (扫黄打非). However, in the area of management of online video programming, a great deal of language has been added — suggesting that this will be an area of focus for the agency. In terms of personnel, the office will be reduced almost to half, with 263 staff as opposed to 508. There will be one director and 4 deputy directors.